Welcome to the Office of Institutional Stewardship! Scholarship students celebrated donor generosity at the 2018 Rose of Lima Dinner. 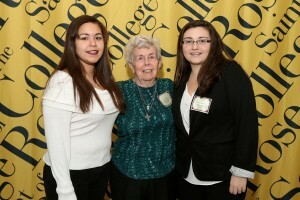 Whether you are a friend of the College, a longtime supporter or benefactor, or even a student who has benefitted from an endowed scholarship or award, you can find out more about endowed funds at Saint Rose and how they impact your life. 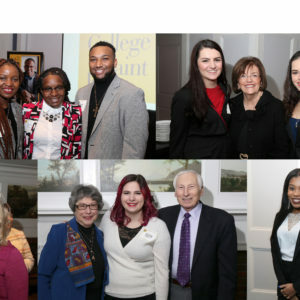 Here, you can learn about how to establish a named fund at the College, the financial policies that guide them, the stories behind the funds currently at Saint Rose, and how we celebrate the generosity of our donors and benefactors. Are you a student who has received an endowed scholarship, endowed award, or Students First Sponsorship? You’ve come to the right place to learn about your award and your role as a student scholar and ambassador to the College. Endowed and stewarded funds have a meaningful and sustained impact on all aspects of the College. The funds support internships and programming, research opportunities for faculty and students, and recognize and promote student achievement. These funds also help us maintain beautiful and functional facilities and up-to-date resources and equipment. 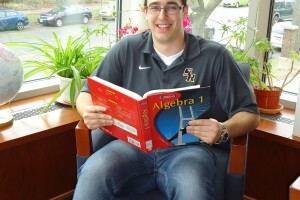 Most importantly, endowed and stewarded funds help to create opportunities for many of our students, regardless of their economic backgrounds, and enable them to be at Saint Rose where they can immerse themselves in unique academic experiences, and find inspiration, encouragement, and support to maximize their potential.